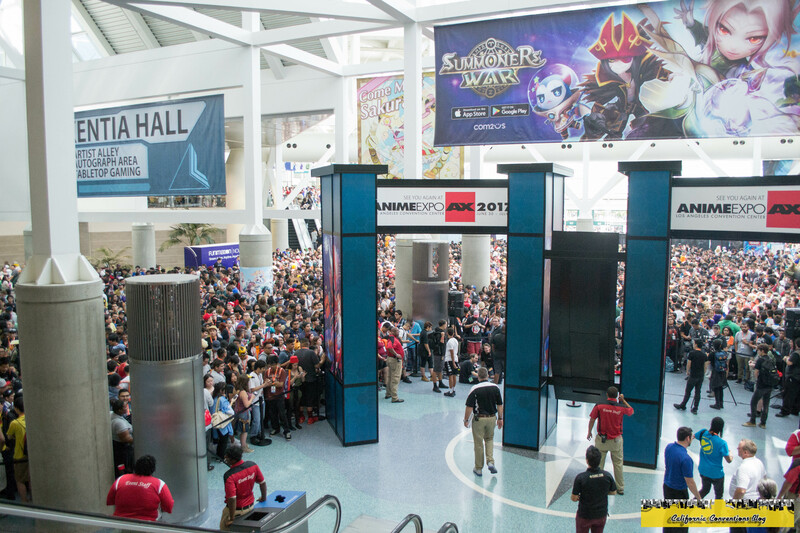 Finally after receiving some much needed sleep, it would be the starting day of Anime Expo. The morning would start off with calling certain members of the blog to see how and what they were doing. I would first call to NorCal division writer Nate and see if we could a collaboration on the Exhibit Hall opening to my surprise he was already at the convention on Facebook Live doing some coverage at 8 in the morning. He did pick up though and said to meet him at the convention for when the time came. I called Tally but no response. The final call I made was to Jeriko, our last technical member. He was in the middle of a workout but said we could meet him for breakfast. It was then I did a preview of what happened the day prior and what to expect today. To our demise of being in LA, there was the dreaded LA morning work traffic that prevented us from having breakfast. We would still stop at the Westin to pick up Jeriko and discuss various convention details. We would park on Hope Street and do a pre-entry convention video and talk what the group wanted to do for the convention over the weekend. 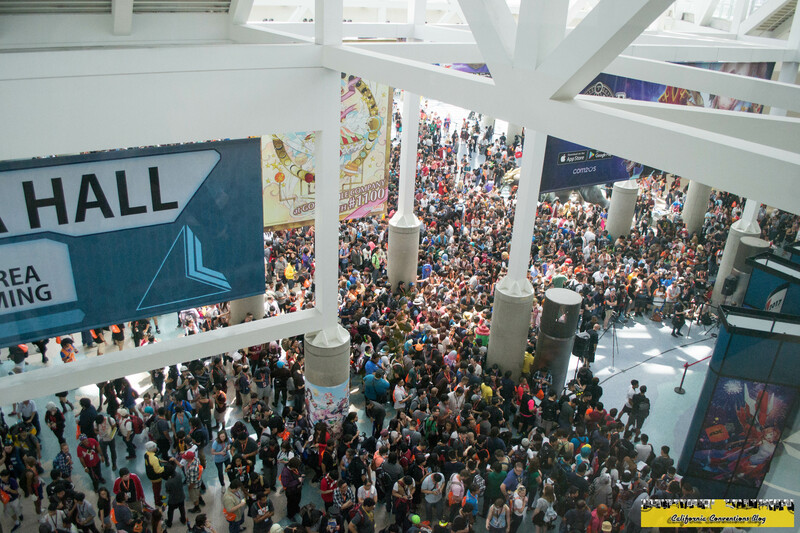 AX being the con it is was already beyond packed outside. We would get by bag checks and meet Nate upstairs close to 11am. With Nate and I on press, we received a slip from the press department stating we could go in an hour early like the Premier fans into Exhibit Hall and events. From this point on, I felt like Wanye and Garth from Wayne's World at the Alice Cooper concert. Just flashing my badge got me into events or areas normal attendees would have to wait or have no access to. This would unfortunately not be the case again for us despite the slip stating otherwise denying Nate and I from getting in. So we decided we'll just cover the usual Exhibit Hall rush. 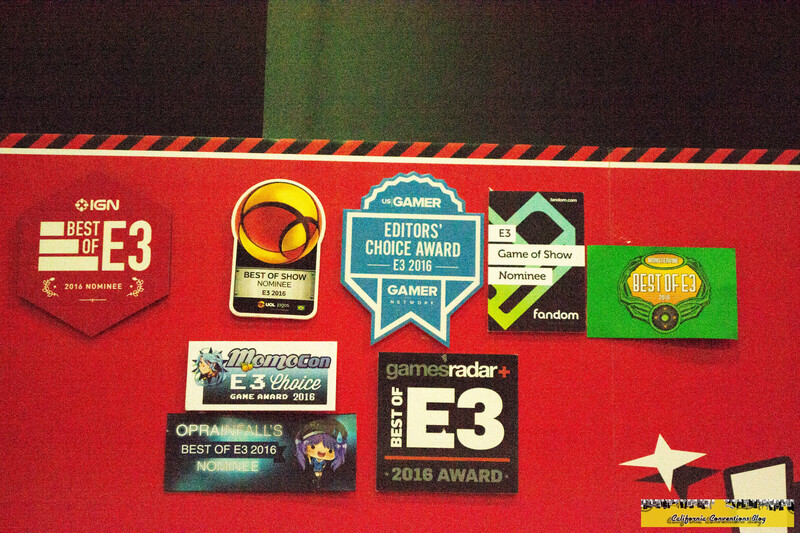 Jeriko would go in on as the insider with his premier badge to get coverage of the hall there. In the mean time, we grabbed some footage atop the escalators. We would also be given permission to come down to the epicenter of the crowd and watch the as they cut the ribbon to commemorate the opening of Exhibit Hall. This year was very festive in the matter as they brought the Taiko Drum Club from CSUSB to open the hall during the cutting, which it feel like we were acending the stairs in full glory to our anime heaven. 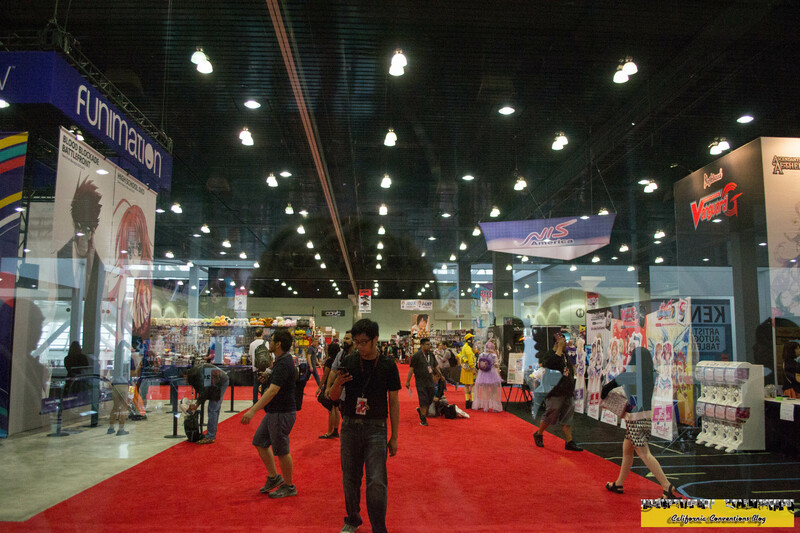 Inside the Exhibit Hall before the rush. Riding down the esclator towards the South Hall lobby. Jeriko would reunite with us as we would nearly die by the stampeade for 2nd straight time! People rushing and running to get the best opening deals! 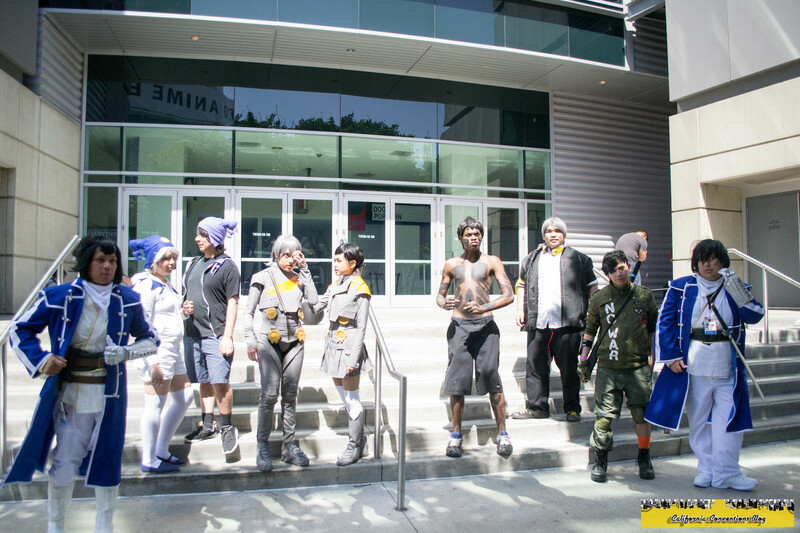 We would follow right into the front of the Exhibit Hall, hitting up Crunchyroll, Atlus USA, then Aniplex. 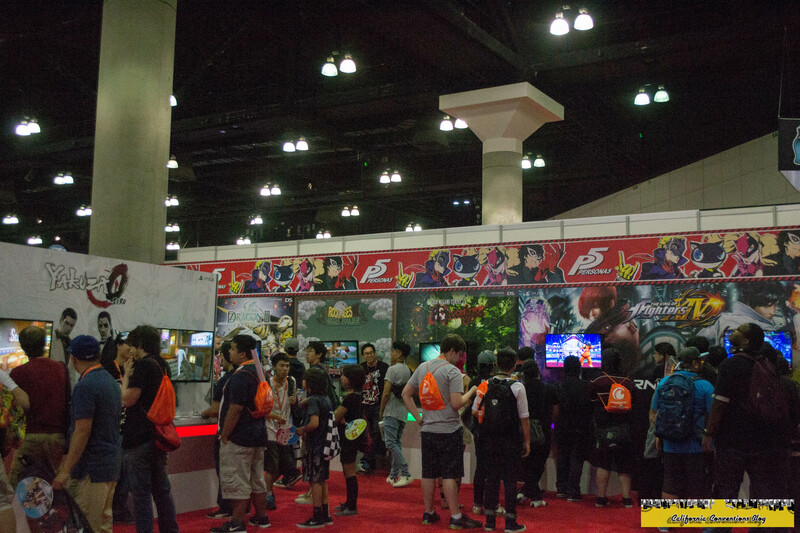 Now if you were an Sword Art Online fan like me, this was your year to be at Anime Expo. 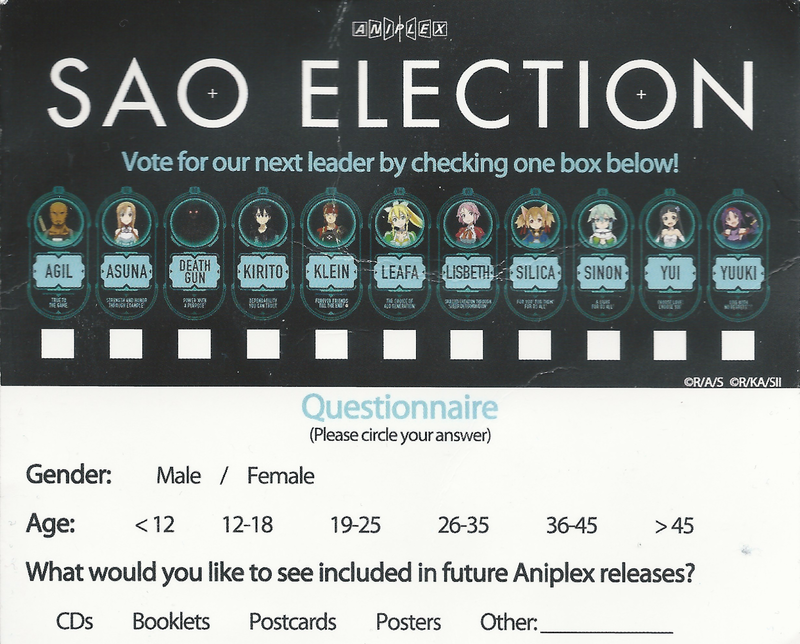 During the entirety of the covention, if you picked up a ballot and voted for your favorite SAO character you be entered for the "SAO Election" and received a exclusive pin of said character showing your patronage. 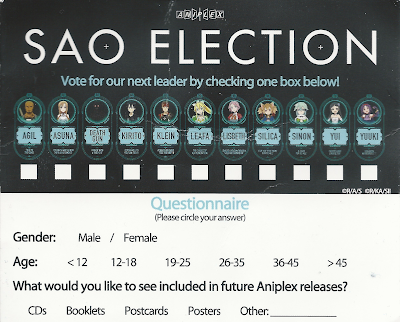 I voted for SAO's best girl, Asuna, and would not be done with the booth. If you went on Instagram and took a photo with a Pair of Aniplex and sony headphones you could get a P3 Winter of Rebirth Poster. me being a persona fan I couldn't resist despite never liking or using Instagram. They also were giving free calanders for the year, so I would go on to pick up two for the house. Since Jeriko and I missed out on breakfast we'd decide to go out to get lunch at the food truck square nearby. luckily we wouldn't have to go across the street as we came across Jogasaki Sushi Burrito, a Japanese-Mex Fusion food truck which incorporates sushi ingrediants and wrapped in thin rice paper to make a nice sushi burrito. I've heard so much about the truck and how the sushi-burrito craze had picked up here in SoCal, so we would decide to eat here. I decided I wanted to take a break and see what the boss was up to. 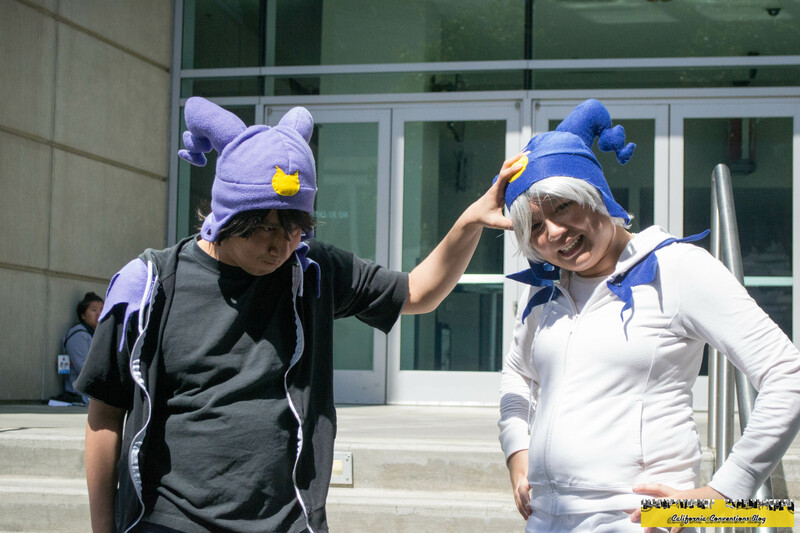 At the same time, we received an email asking if we wanted to interview Teddyloid. Excited, I would head to the press lounge to prepare to talk with him. I would go on to find out that unless you had to interview a exhibitor or guest of a booth was the reason we couldn't get in to the Exhibit Hall early. Sadly, while I was there we heard that the Teddyloid interview we had setup was canceled because Teddy's management denied all interviews. 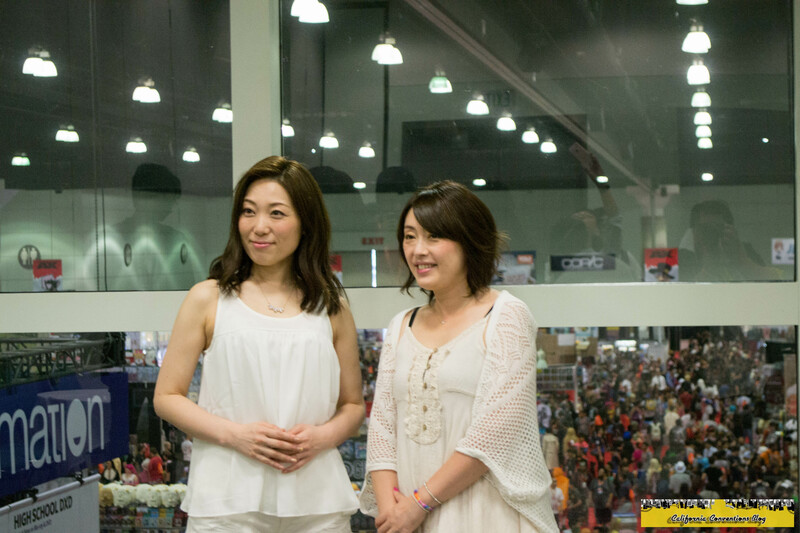 However, while in the press lounge I was asked by one of the heads of press to interview Minami and Ishida Yoko. 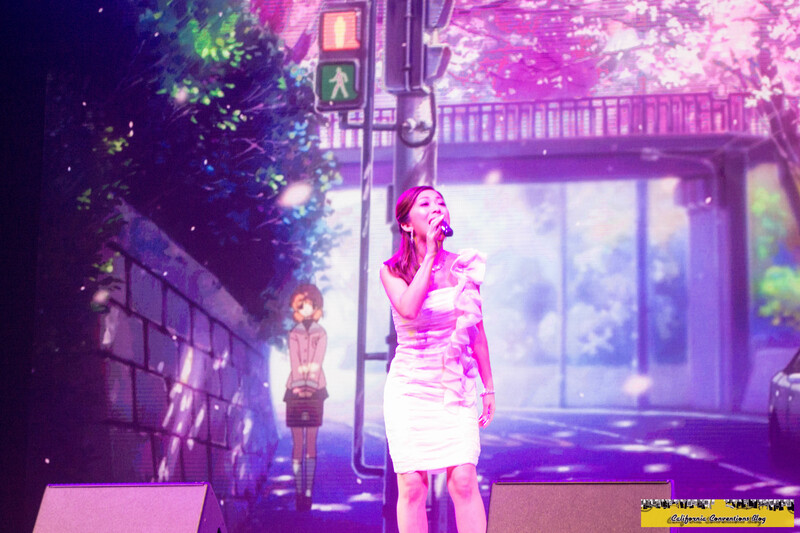 Despite not knowing much of either musical guest except for the knowledge of Minami singing the theme of School Days, I abided by their request and went next door to interview the pair. I recently had started playing School Days after this report was written so I was in a room where I had no idea about the guests so I had to look up information and found out that Ishida-san was a singer for some of the Sailor Moon series. I would go on to ask her if she was shocked and or how it felt to write a piece for such a lengendary series. I would also ask both guests like I did with the other musical guests who they would colaberate or battle with the other musical talent attending. Both would instatntly reply "a colaberation with JAM Project" and that they have worked with the band prior; however ,on the other side of the question they would reply that because so many great artists are there they wouldn't want to seem they are battling each other but to work in unison to ensure the fans have a wonderful concert the following day. I would take off from the gathering to line up for Opening Ceremonies but as formentioned I flashed my badge and got in to another event that was going on before opening without hassle. The event was just starting but was a very interesting and educational panel of how Anime as a whole evolved over the last 100 years. 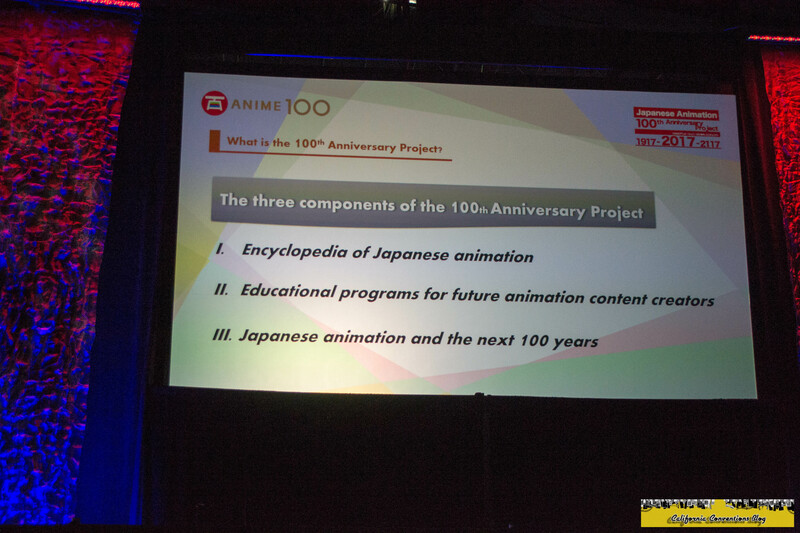 Also discussed was how they would like to make Anime more acessable to the masses by the next few years. As the panel ended I would move from the front corner section to dead front and center for Opening Ceremonies. I was planning on going to a JoJo's Bizzare Adventure panel an hour later but was unable to attend because like most main events at this year's AX ran late. 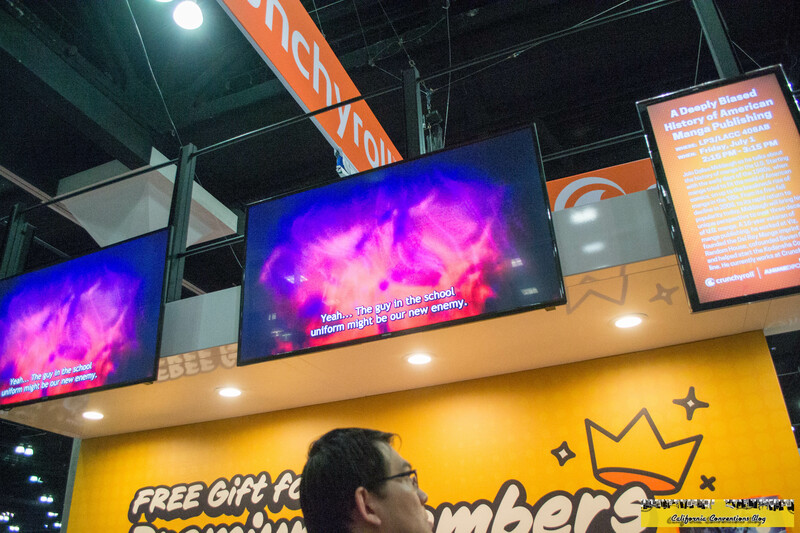 AX MC and smart doll creator Danny Choo would stall for the hourly delay and bring up guests and find ways to entertain us until we could get underway. 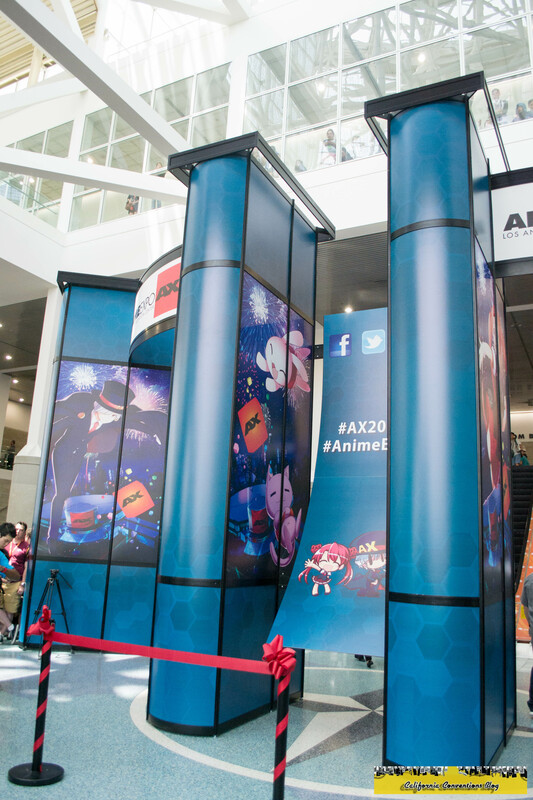 Sadly we had to endure the AMV video "25 Years of AX" 3 to 4 times during the presentation. Finally, after many delays and Danny running out of ideas, we were on with the ceremonies. 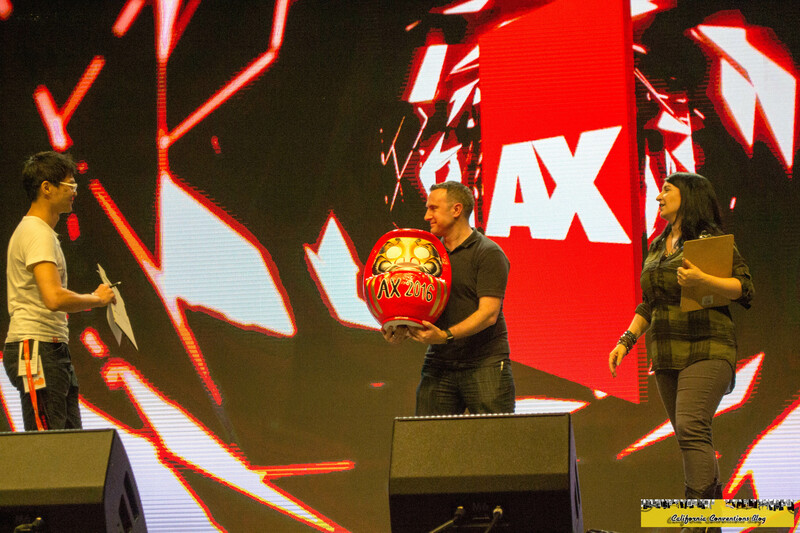 As a tradition at AX every year or any major event in Japan, there was the the eye drawing of the daruma doll. Then all the music guests came out and introduced themselves to promote the Japan Music Masturi Live. As the musical GOH's left the stage one would enter, none other than musical sensation Lia. Lia would go on to state she would be performing at the halftime show during Masqurade and that she had a surprise for those of us currently at Opening Ceremonies. We would receive 3 song set performance from her. Me being a fan of Lia, I nearly died in excitement as she would perform the openings of Clannad Afterstory, Air, and Charlotte. slightly disappointed we didn't get My Soul, Your Beats! from Angel Beats!. Her performance signaled the end of Opening Ceremonies. 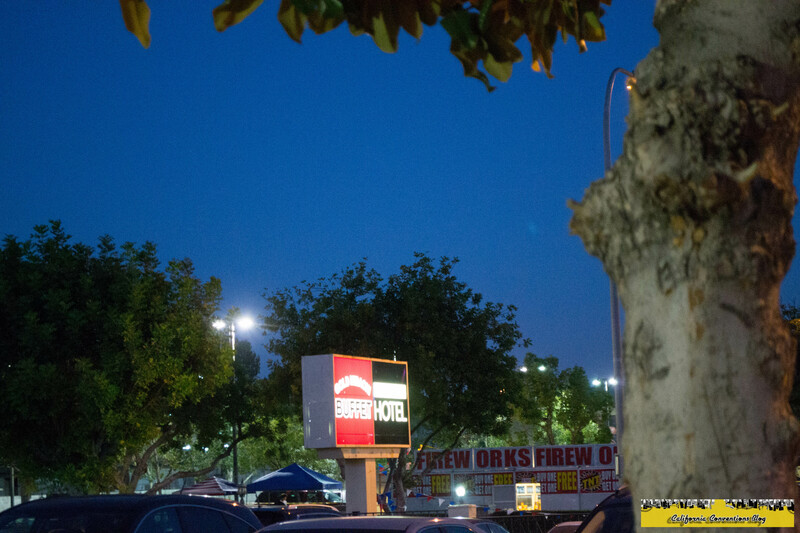 It was already late into the evening and James didn't feel like attending the Cosplay Deviants event so we hooked up with his friends and went to an all-you-can-eat hibachi resturaunt. Filled, we would go home play some Resident Evil 5 HD and go to bed. Excited for what events were going to transpire the next day I hard time sleeping but finally dozed off.